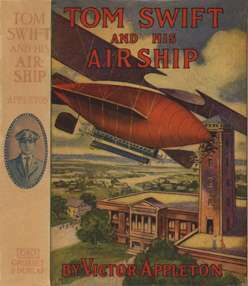 Tom Swift and His Airship; or, The Stirring Cruise of the Red Cloud (1910) was particularly popular leading up to the Great War, part of the popular juvenile science fiction and adventure series in which the main character creates amazing wartime inventions to save the day. In this story, Tom invents an innovative airship that is half dirigible, half bi-plane, featuring an outlandish gondola with a kitchen, engine room and observation room. His father, Barton Swift, also an inventor, designs what will be the world's most advanced submarine. These books were great escapes from the realities of fear and loss during the War. Chapter 17 - "Wanted for Robbery!" Return to the Victor Appleton library.